Companies are winning over the Securities and Exchange Commission in their use of unofficial accounting figures, a year after a crackdown on the practice. Medtronic PLC, Coca-Cola Co. and Boston Scientific Corp. are among the 35 out of 51 companies that have successfully demonstrated to the regulator that their adjusted earnings figures aren’t misleading investors. That outcome highlights how the complexities and nuances in corporate accounting are complicating the SEC’s job in policing earnings. For example, some companies are vulnerable to customer lawsuits that blur the line between an occasional expense and a regular cost necessary to operate the business. Similarly, a restructuring plan announced in one year can bleed across several years, clouding the distinction between a discrete cost and a recurring expense. Large companies have the money and resources to lay out a successful, detailed defense of disputed accounting practices. Chief financial officers can tap a vast brain trust of internal finance teams, consultants and legal counsel, as well as the board’s audit committee, to respond to SEC concerns. The agency last May issued new guidelines on the use of adjusted earnings and other figures inconsistent with U.S. Generally Accepted Accounting Principles. The move came amid concerns that these figures can misrepresent company performance and often furnish investors with a rosier picture of results by excluding unusual charges or the impact of currency swings. The regulator questioned dozens of companies on whether some of these adjustments exclude regular business expenses and could be misleading, according to an Audit Analytics analysis for The Wall Street Journal. In 69% of cases the SEC backed down and concluded its conversations with the company without forcing a significant change to its adjusted earnings presentation. Medtronic in a Nov. 4 letter defended omitting restructuring costs from adjusted earnings after the SEC asked whether it was misleading because it excludes regular business expenses. “Restructuring charges are not necessary to operate the business and are not necessary to generate revenue,” said Karen Parkhill, CFO of the medical-technology company, in a letter to the regulator. The SEC scored many victories early in its push against the proliferation of non-GAAP metrics. More than a quarter of S&P 500 companies voluntarily changed their press releases to report standard results first after the SEC updated its guidance last year. Moreover, 29 out of 42 companies that were questioned about their use of so-called tailored revenue metrics, another non-GAAP figure forbidden by the new rules, changed their presentation of results to satisfy the SEC’s concerns, according to Audit Analytics data. Tesla Inc., for example, said in an Oct. 2 release it would drop non-GAAP revenue and other custom metrics. The decision came after the SEC in an August letter questioned the company’s use of “individually tailored” accounting figures. The challenge for the SEC lies in drawing a distinction between outliers and regular business expenses, when many fall into a gray area. Finance chiefs and regulators must examine the company’s particular facts and circumstances to decide whether adding back certain expenses is misleading figure. 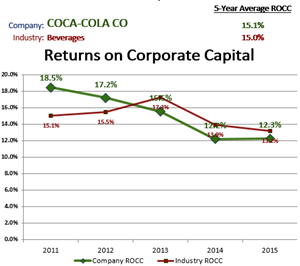 Coca-Cola told the SEC that what may at first appear to be recurring business expenses are in fact unique charges. 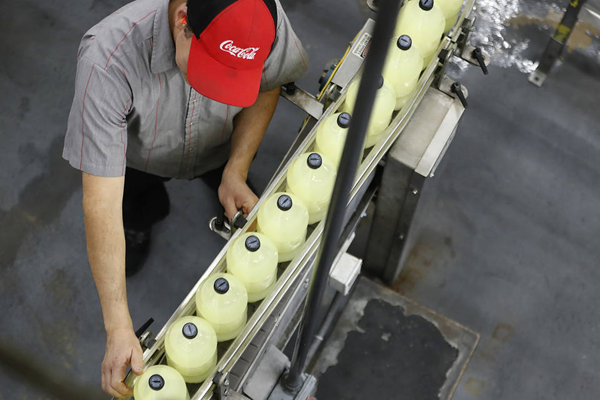 The beverage maker adjusted its 2016 results for costs from an overhaul and subsequent divestment of its bottling plants in Germany. It also excluded nonroutine charges such as severance pay, consulting fees and write-offs linked to a cost-cutting program expected to end in 2019. “We believe these restructuring charges and charges related to our productivity and reinvestment program are not representative of the company’s underlying operating performance and thus are appropriately excluded,” said Larry Mark, controller, in a letter to the SEC in October. A Coca-Cola spokeswoman declined to comment. A spokesman for Medtronic said in an email that the company “responded directly and openly” to the SEC. SEC correspondence becomes public about 20 days after the regulator judges the matter closed, although conversations can last for months and cover multiple topics. It isn’t known how many matters are pending, as the SEC doesn’t comment on cases. Companies should establish a policy for how they calculate non-GAAP figures to ensure the practice is consistent from one period to another, said Beth Paul, partner at accounting firm PwC. Executives should work through the nuance and judgment and be prepared to defend it to the audit committee. “That makes responding to a comment letter easier because you’ve talked through why it is you’ve made the adjustment,” Ms. Paul said. Boston Scientific referenced its internal policy for which charges and credits should be excluded from non-GAAP measures in response to an SEC query in a Sept. 30 letter. The Marlborough, Mass., company said the guidelines ensure that a materiality threshold is applied to certain items, including litigation charges, to ensure it is appropriate to exclude them from non-GAAP measures. “We also provide disclosure regarding the nature of those adjustments to further ensure that they are not misleading to investors,” finance chief Daniel Brennan said in a letter to the SEC. 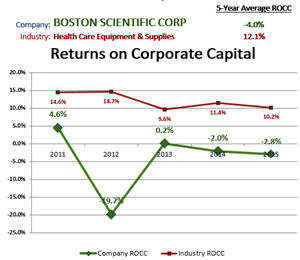 Boston Scientific declined to comment. Some companies have been less successful in defending their adjusted figures. 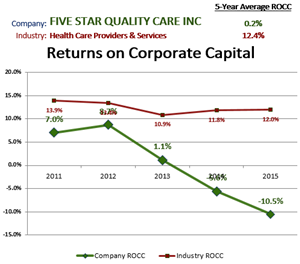 The SEC asked senior-housing provider Five Star Senior Living Inc. to explain why rent wasn’t a normal, recurring, cash operating expense necessary to run the business. The Newton, Mass., company rented 88% of the units it operated as of the end of 2016 and had furnished investors with adjusted earnings that omitted rent costs. Five Star in January argued that the figure wasn’t misleading because rent is analogous to the interest paid on the loans for company-owned properties. A spokeswoman for Five Star Senior Living declined to comment. 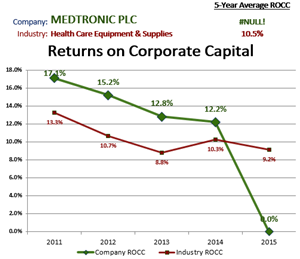 The following graphs present corporate performance for the companies addressed in the article, compared with their industry competitors, based on SEC-reported GAAP results for periods through 2015 as defined below. Full-size graphs of these and other companies you may select can be generated on the Shareholder Forum's website for its current Returns on Corporate Capital™ project. 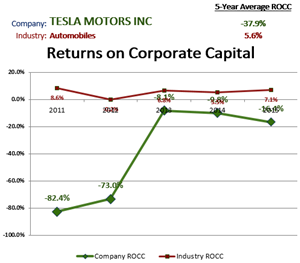 Returns on Corporate Capital™ are a performance measurement developed in a Shareholder Forum workshop project, and are calculated from an S&P Compustat database of each company's SEC reports of GAAP-defined net income plus interest expense and income taxes, divided by its prior year’s ending balance of total assets less current liabilities other than interest-bearing debt. Comparative averages for the company's industry are based on aggregate amounts for all reporting Russell 3000 companies in S&P's six-digit Global Industry Classification Standard (GICS), excluding the amounts for the subject company. Final workshop definitions of analytical methodology and calculations based on EDGAR Online data of directly sourced, unadjusted company reports for periods through 2016 will be reflected in July 2017 updates of the graphs. © Copyright 2016-2017 The Shareholder Forum, Inc.